Rikkyo University has two campuses: one in Ikebukuro, Tokyo and the other in Shiki, Saitama-prefecture which borders on Tokyo in the south. The main campus is located in Ikebukuro, one of the largest commercial and transportation hubs in the heart of metropolitan Tokyo. And our Ikebukuro campus where JDS fellows will study is only a few minute-walk from the Ikebukuro-Station. Rikkyo was founded in 1874 by an American Bishop, and has a long history of excellence in education and research, which, combined with substantial investment in state of the art information technology and teaching facilities, has earned a reputation as an outstanding educational institution and one of the most sought-after universities in Japan. In 2014, based on the achievements and potential for excellence, the Japanese Ministry of Education, Culture, Sports, Science and Technology selected Rikkyo as one of the 37 universities for special funding through the Top Global University Project. The Project lasts for 10 years. 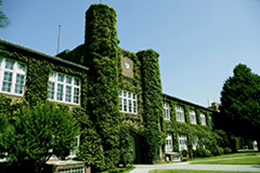 Today, Rikkyo enrolls over 19,000 undergraduate and 1,200 graduate students in its ten colleges (Arts, Business, Community and Human Services, Economics, Intercultural Communication, Law and Politics, Contemporary Psychology, Science, Sociology, and Tourism) and fourteen graduate schools (Business, Economics, Arts, Tourism, Science, Sociology, Law and Politics, Community and Human Services, Contemporary Psychology, Christian Studies, Business Administration, Intercultural Communication, Law, Business Design and Social Design). Rikkyo, from its inception, has valued international exchange with esteemed institutions abroad. Rikkyo has exchange agreements with over 100 universities in the Asia-Pacific region, Europe, North and South Americas. Rikkyo believes our campus life, both academic and social, will be greatly enriched by diversity. The Graduate School of Business (GSB) was established upon the foundations of the former Graduate Program in Business Administration of the Graduate School of Economics and the Graduate Degree Program in Applied Sociology of the Graduate School of Sociology. It conducts specialized interdisciplinary studies in the field of business administration based on the traditions of these two programs. The Graduate Program in Business Administration conducted business management-related education and research based on business administration and accounting, while the Graduate Program in Applied Sociology places its theoretical basis in industrial relations. Industrial relations was originally a field that focused on labor issues, but in recent years it has come to cover other aspects of corporate activities, including marketing and consumer behavior, the relationship between industry and the local community in terms of corporate social responsibility, and business strategies for responding to the rapidly changing values of industrial society. The GSB has incorporated these studies in industrial relations into business management studies to nurture a wide range of professionals, from researchers to highly-trained experts, who can approach the dynamically changing modern business environment from an international perspective. The GSB faculty members have been conducting the Business Leadership Program (BLP) and the Bilingual Business Leader Program (BBL) for their undergraduate students. Through these programs, the GSB educates students to play an active and leadership role in a global society and global business environment. Between 2008 and 2010, the BLP had been supported by the Ministry of Education, Culture, Sports, Science and Technology of Japan (MEXT). The GSB faculty members have also been conducting joint research very actively with other researchers and industry practitioners in Japan and the world on such issues as strategic management, business management, corporate finance, industrial policies, corporate governance, corporate social responsibility and socio-economic development. The Master of International Business Program (MIB Program) was established to respond to industry demand for highly qualified, bilingual graduates with wide-ranging international experience and ability to conceptualize business problems. There are two courses in the MIB Program: Master of International Business Course (MIB Course) and Master of Public Management and Administration Course (MPMA Course). JDS fellows will enroll in the MIB Course. The MIB Course trains JDS fellows with limited prior professional experience but strong leadership potential, and those who have experience but want to expand their understanding of theoretical and conceptual issues. All courses are taught in English, preparing graduates to achieve their goals and boost their careers both in private and public sectors. <MIB COURSE> The Master of International Business Course (MIB Course) is an MBA type of program and has an established reputation. Although the MIB Course was initially designed for students from private sector, it is also suitable for those government officials who need to have knowledge and skills in private sector’s business management analyses in a broad way. Those officials will also benefit from additional economics and public management courses offered by the MPMA Course. In the first Semester, JDS fellows take the Business Proposal Core, a set of integrated and functional skill modules offered in sequence. From the second Semester on, students take courses from a wide range of courses including economic and public management elective courses offered by the MPMA Course. JDS fellows will complete a Final Research Project in the second year: writing a research paper and making a presentation in front of faculty members. Upon completion of the MIB Course requirements, JDS fellows will be awarded a Master of International Management degree. Nepal has been developing slowly yet steadily. Nonetheless the country still needs to develop and diversify its industries in order to bring substantial economic growth. Nepal’s GDP depends largely on agriculture and remittance by expatriates and the country desperately needs to improve its business environment to create new businesses, to promote foreign and domestic investment. Most importantly Nepal needs officials with leadership who can well deal with and who have knowledge and skills to overcome these issues. The educational and research philosophy of the Graduate School of Business (GSB) is to educate students to become leaders and experts who are equipped with knowledge and abilities necessary to analyze various management issues in new global environments using a variety of approaches. The GSB offers two English-medium master’s courses, Master of International Business (MIB) Course and Master of Public Management and Administration (MPMA) Course. JDS fellows will enroll in the MIB Course. Although the Master of International Business (MIB) Course was initially designed for students from private sector, it is also suitable for those government officials who need to have knowledge and skills in private sector’s business management analyses in a broad way. In the first semester, JDS fellows take the Business Proposal Core, a set of integrated and functional skill modules offered in sequence. From the second semester on, fellows take courses from a wide range of elective courses including more economic and public policy-oriented courses offered by the MPMA Course. JDS fellows will complete a Final Research Project in the second year under the close supervision of the supervisor: writing a research paper and making a presentation in front of faculty members. Upon successful completion of the MIB Course requirements, a Master of International Management degree will be awarded. The BPC involves a set of integrated and functional skill modules (6 modules) that students in the MIB Course take in sequence during the first term of enrollment in the first year. The BPC modules consist of: Conceptualization and Planning; Strategic Business Planning; Market Analysis and Planning; Business Research Methodology; Financial Analysis; and Business Communication Theory and Practice. Students work in teams, taking the skills learned from each module, and directly applying them to create a competitive business proposal. A panel of faculty review student output after completion of each module and provide feedback. The MIB Course provides JDS fellows with a wide range of elective courses which are offered in the second, third and fourth terms of enrollment (spring semester in the first year and fall and spring semesters in the second year). JDS fellows need to earn at least 16 credits from this component. Because the MIB Program offers both MIB Course and MPMA Couse, JDS fellows will be able to take additional courses especially in the areas of economics, development policies and public management offered by the MPMA Course. Under the supervision of an academic advisor, JDS fellows choose their own final research project topic and complete the project by writing a research paper and making a final presentation. JDS fellows will choose a practical topic, analyze the issues utilizing the knowledge and skills they have learned, and suggest optimum options and solutions. Each course carries two (2) credits. MPMA elective courses are available to JDS fellows. Various Japanese language courses are also available to JDS fellows. Those faculty members who belong to the Graduate School of Business who are capable of supervising/advising JDS fellows are listed below. Each JDS fellow will be supervised by a supervisor. (1)	Libraries and Study Rooms: Rikkyo has one of the largest and best libraries in Japanese universities with large selections of books, journals, and English-medium data bases and software. Study rooms with PCs are available for JDS fellows. (2) Sports facilities: Rikkyo has a new gymnasium, opened in April 2013, which accommodates an Olympic-size swimming pool, indoor tennis courts, basketball stadium, training room etc. (3) In addition to the International Center which takes care of the overseas student’s non-academic needs, there are English-speaking staff in the program office to assist JDS fellows. The Master of International Business Course of the Graduate School of Business (GSB) wholeheartedly welcomes JDS fellows from Nepal. The educational and research philosophy of the Graduate School of Business (GSB) is to educate students to become leaders and experts who are equipped with knowledge and abilities necessary to analyze various issues in new global environments using a variety of approaches. From the first semester, you will be exposed to case methods, which will help you develop your analytical as well as problem-solving skills within a limited amount of time. You can expect a wider variety of elective courses because you can take the elective courses offered by the MPMA Course. In addition, Rikkyo classroom settings and community will let JDS fellows mingle with and learn from students and faculty from different backgrounds. You will be studying along with other young government officials. Most importantly, expect to work hard with our team of excellent faculty members. Our expert faculty members provide intensive learning and research opportunities to our students based on their extensive professional experiences. A supervisor will be assigned to you in the first year. However, as the Rikkyo faculty work together as a team, you will always be supported by and get advices from all of our faculty members. Our faculty include those who have years of supervising JDS fellows and government officials from Asian countries. Japan is one of the world’s largest economies and the home of many of the world’s leading companies in the automotive, electronics, computer games, and information technology industries – most of which are headquartered in Tokyo. The MIB Course of the GSB is located in the district of Ikebukuro, which is one of the major commercial and transportation hubs of Tokyo. The Ikebukuro district, where the Rikkyo’s main campus is located, has long been enjoying cultural and ethnic diversity. The combination of a good place and good people makes for a great experience. I had already spent two years in Japan so it was not difficult for me to start daily life here. I can speak little bit Japanese which was helpful for my survival. I started to live in Saitama prefecture where I met my old as well as new Nepali friends who gave me family environment in the absence of my family. This place is far from university but one-hour travel is normal in Japan. Hospital, shopping malls and train station is quite near from this place so I am enjoying my stay here. Rikkyo University is very beautiful with its leaf covered building layout and peaceful nature although it is crowded. We can meet many international students as well as Japanese students as our classmate. Japanese students are very helpful and polite. They helped me many times when I did not know about the system of University. I was surprised when I knew about blackboard system of Rikkyo University. It is an information system where professors upload reading materials and information about homework. Students should check blackboard regularly and update themselves on the information provided by professors. As a JDS fellow we can use study room of MIB and MPMA whichever we like, also we can use other study rooms, inside or outside the library. I was surprised when I used study room for group work because the facility provided by college was beyond my imagination as a student from Tribhuvan University. I had never experienced such facility in Nepal. We can use Rikkyo online database system for research material and also, we can join Research Round Table Seminars in Rikkyo. Stata is one of the useful software which we use for analyzing data during our research. Besides study, the University organizes cultural programmes and arranges tours in different places for cultural exchange and sight-seeing. These extracurricular activities are very informative, exciting and contributes to refreshment and recreation.